Paramount Pictures is getting into the Christmas spirit today, debuting a brand new holiday greeting and new photos from The Spongebob Movie: Sponge Out of Water. 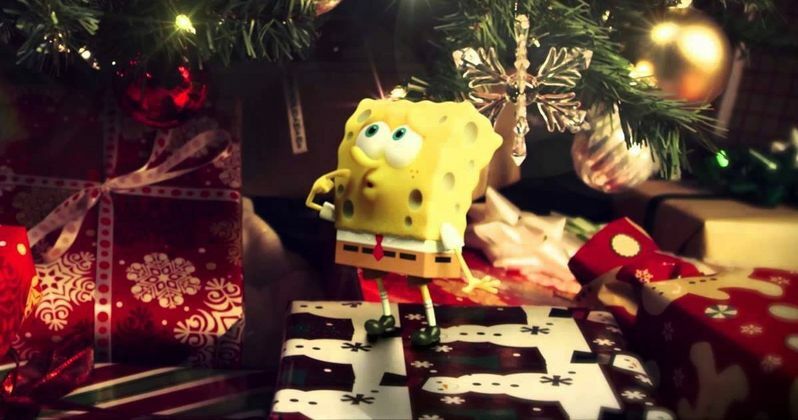 Spongebob Squarepants (voiced by Tom Kenny) wishes fans a happy holiday season, while Patrick Star (Bill Fagerbakke) is seen in an uncomfortable position in this Christmas greeting. This follows special messages from Marvel Studios, Star Wars, The Babadook and Hotel Transylvania 2 that have debuted over the past few days. If that wasn't enough, Paramount has also debuted new photos from this animated adventure, featuring Spongebob, Patrick, Squidward (Rodger Bumpass), Mr. Krabs (Clancy Brown) and the nefarious pirate Alameda Jack, portrayed in live action by Antonio Banderas. This live-action/CGI hybrid follows SpongeBob as he goes on a quest to discover a stolen recipe that takes him to our dimension, our world, where he tangles with a pirate. Take a look at the brief holiday greeting along with the new photos below from director Paul Tibbitt's animated sequel, arriving in theaters February 6, 2015. Stay tuned for more footage and photos as we get closer and closer to the release date.